History is full of one-hit wonders, the people who were just here to have a good time and somehow struck it big in the process. Back in the 1930s, that’s how Eileen Ellison approached the racing world, and that’s how she found her success. See, Ellison was born to Sidney and Theresa Ellison, a couple with just enough money in their bank account to support their childrens’ habit. Her brother Tony was a racing fan, and, well, Eileen fell head over heels in love with the sport in the late 20s as she accompanied her brother to the track. She wasn’t out to make a name for herself or set records. Instead, in a rare feat at the time, she was just here to for a damn good party, and no one had much to say about it. Because of that, Eileen’s biography reads like a much smoother ride than some of the other women I’ve covered in this series. As per Fast Ladies, Female Racing Drivers from 1888 to 1970, very little is known about her, but it seemed that she was merely content to get behind the wheel of her second-hand Bugatti T37 wherever she possibly could. If that mean being confined to women’s handicap races at tracks still welcoming to the female gender, then so be it; she wasn’t one to complain. She started off as a car entrant, not a racer. Driver Thomas Cholmondeley-Tapper needed a car, and Ellison was able to provide her Bugatti and all the connections that came along with it to him. That’s how her name first became known in the racing world; she was here to watch, not to drive. But if you’re at the track and have a car, it kinda makes sense that you might get a little hot under the collar wondering what it’s like to, y’know, throw that bad boy around a circuit at speed. So Ellison entered the Duchess of York’s race for female drivers in 1932. That race, held at Brooklands, featured some of the biggest names in racing at the time: Elsie Wisdom, Fay Taylour, Kay Petre, and more. And, just to show her mettle, Ellison went out there and won the damn thing. That’s a title she took from Kay Petre, who was arguably the most notable female driver at the time. Talk about an underdog move. After that, it was next to impossible to get Ellison out of the driver’s seat. She finished third alongside Cholmondeley-Tapper in the August Senior Mountain Handicap race. She entered the Cobham Junior Short Handicap and finished second. She even joined an all-female team in 1934 for the Brooklands relay race. That relay race was an interesting one. Ellison was sharing a Singer works car with Petre and Sheila Tolhurst. While they were racing alongside all the teams of men, they were more interested in securing the Ladies’ Prize, which meant a guaranteed entry to Le Mans. However, the Ladies’ Prize could not be awarded to any of the top three finishers. So, despite the fact that Ellison and co. had the speed to secure a podium, they had to sandbag to keep themselves in fifth place to stay out of the top three. They managed to finish there, and the three women were rightly overjoyed. They were going to Le Mans, the most iconic endurance race to this day! Well—not quite. Only Petre managed to make her way to Le Mans. Ellison and Tolhurst were left behind. The two women never got their chance to prove their mettle at the race of a lifetime. Despite her bitter disappointment, Ellison was still dedicated to racing, and she was determined to have her race in France. 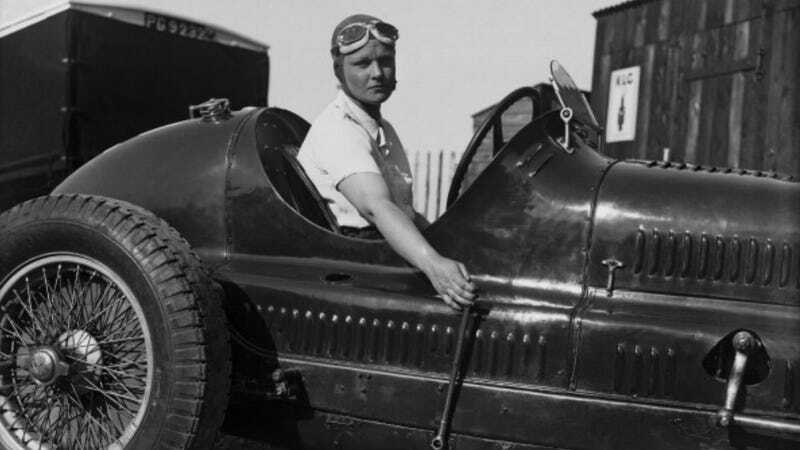 She attempted the Albi Grand Prix in 1935, where she ran as high as fourth place before finishing seventh overall—not a half bad showing for someone driving a T37A for the first time. She even finished on the podium at the Lorraine Grand Prix, albeit in the Voiturette class. It was promising enough that she crossed the ocean to South Africa and traveled out to Hungary the following year chasing her dreams. In the meantime, Sammy Davis mentions in his book Atalanta that Ellison was competing in hillclimbs. There isn’t much known about her success in those ventures. Still, Ellison’s career suffered the same fate as plenty of other female drivers of the era. World War II struck hard, and motorsport was brought to a complete stop. Ellison married Squadron Leader Brian Lane in 1940 only for him to be killed in action two years later; it was heartbreaking for Ellison, and her mourning didn’t provide any inspiration to get back behind the wheel doing something dangerous. But Ellison had also fallen in love with something else: South Africa. She had been entranced during her visit while racing, and so soon after she finished mourning her husband, she made the intercontinental trek to find a new life. What she found was Owen Fargus, a landowner whom she fell in love with. The closest thing Ellison got to racing after that was the glamorous jet-setting lifestyle of a woman with property. The couple traveled all over the world, but Ellison never raced again. She passed away from what was most likely cancer in 1967, although she was often reported to have jaundice due to the stigma surrounding cancer. Historians debate Eileen Ellison’s impact in the history of motorsport, but I personally believe she was important. Ellison was one of several women who made racing work for her despite the stigmas and barriers in place. She was doing the kind of thing I’d love to see more women doing: racing just to race. Not every woman needs to be a constant winner. Not ever racer does, either. Ellison merely proved that women could do this whole racing thing, too, and that they could do it damn well if they set their minds and hearts on it.